Today I made the long train journey from Aberystwyth to London, so I have just a brief post about the spherical stone objects above. 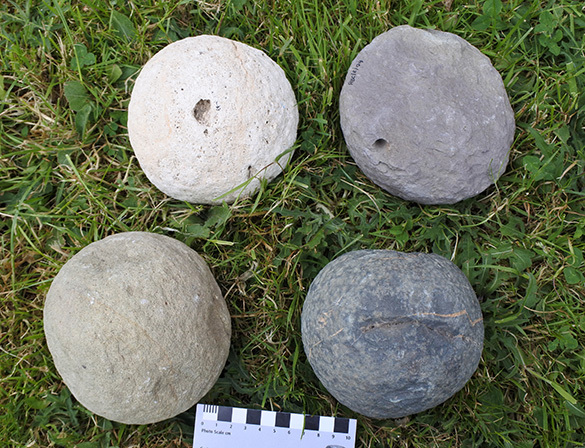 They are stone cannon balls recovered in an archaeological investigation of Aberystwyth Castle. 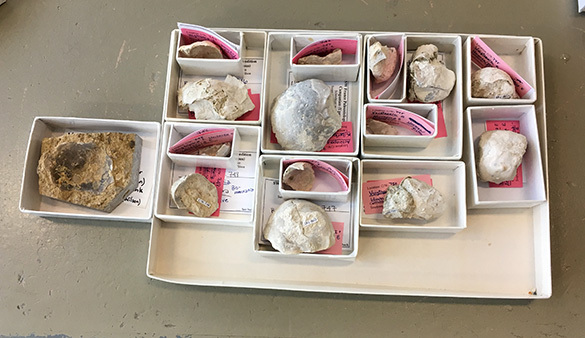 Tim Palmer is examining them to determine from what geological units they derive. 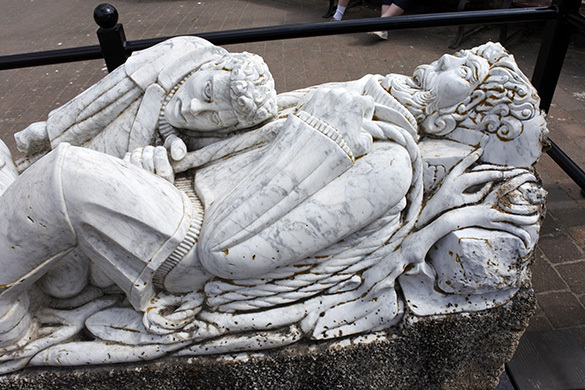 They were hand-carved to fit into the Medieval cannons used during a siege of the castle. Caroline Palmer wrote an excellent description and interpretation of these cannon balls in her great blog Letter from Aberystwyth. She wrote of two of them: “One is of limestone from Dundry near Bristol, and the other of a dense greeny-grey sandstone which could be from Somerset or South Wales. The surface is crudely tooled and pitted and to the casual glance they look strangely like a pair of seriously decayed Galia melons. They are heavy, 5½lb and 6½lb respectively, and just under 6 inches diameter. 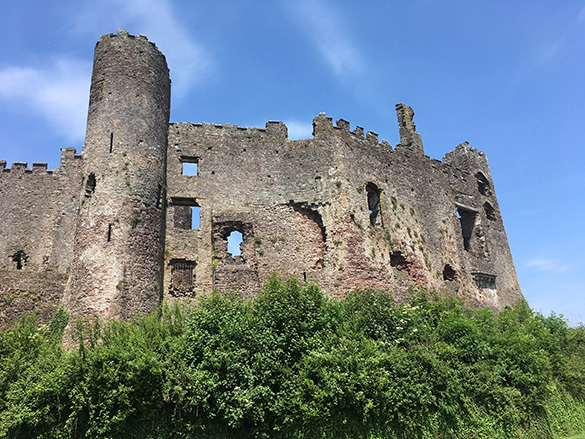 One has scarring on its side which could have been a result of its violent impact on the castle.” Check out her post for images of Medieval cannons and accounts of how they worked. 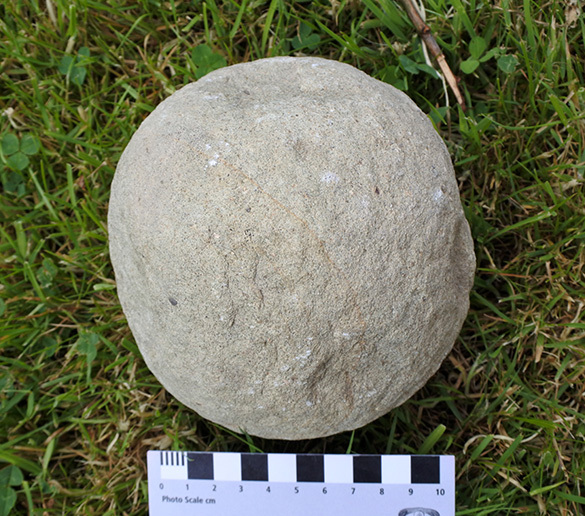 This is the cannon ball likely made of Dundry Stone. I suspect Dundry Stone, a Middle Jurassic Limestone, is Tim’s favorite building stone. Now we need a study to see how it can withstand whacking against a castle wall! Aberystwyth, Wales — My last full day in Wales with my hosts Tim and Caroline Palmer was again different from every other day in this country. I have had a stimulating diversity of experiences on this short trip. 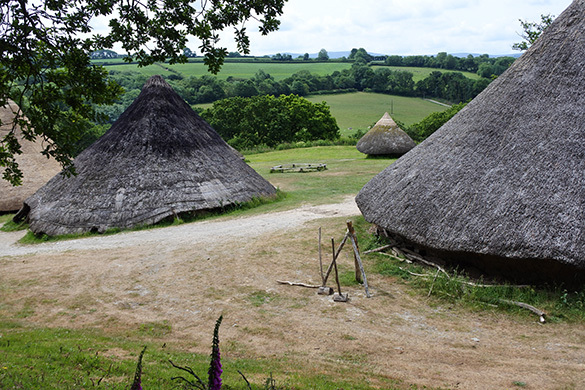 For example, today we visited the Iron Age village reconstruction of Castell Henllys in Pembrokeshire (above), which was very new to me. 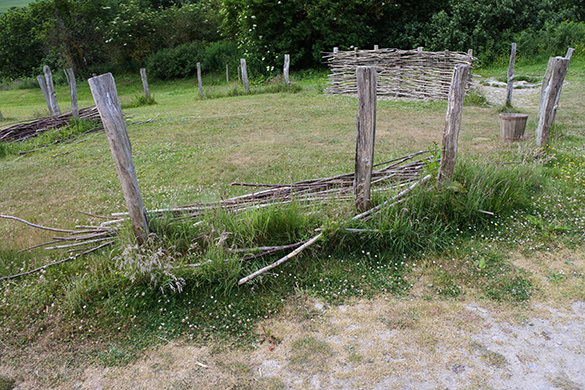 The roundhouses are constructed on the actual archaeological site, with even the posts placed in the ancient postholes. Some roundhouses are left unfinished to show the post and wattle construction, the walls of which would be later daubed with mud and the characteristic round thatched roof attached. 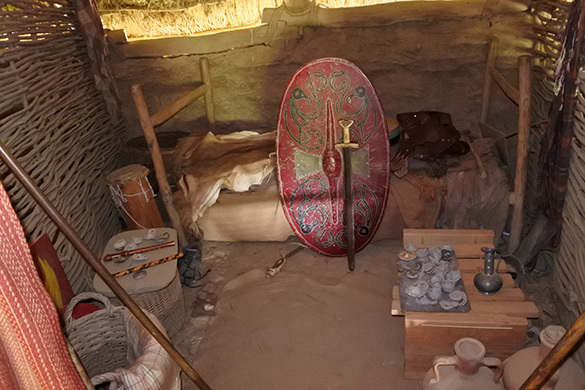 This is one of the reconstructed rooms, complete with Celtic gear circa 2300 years ago. The village is maintained as a living museum, so fires are kept smoldering for an appropriately smoky interior. 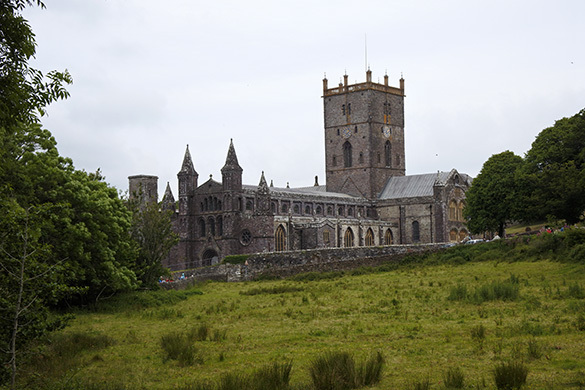 We also spent time in St. David’s Cathedral in Pembrokeshire. Tim gave me a stone-and-history tour inside. A fee was required to take photographs, so I abstain. You’ll just have to imagine Medieval stone effigies, towering pillars, and centuries of stone memorials. Our last stop was the small and unique St. Lawrence’s Church in Gumfreston. 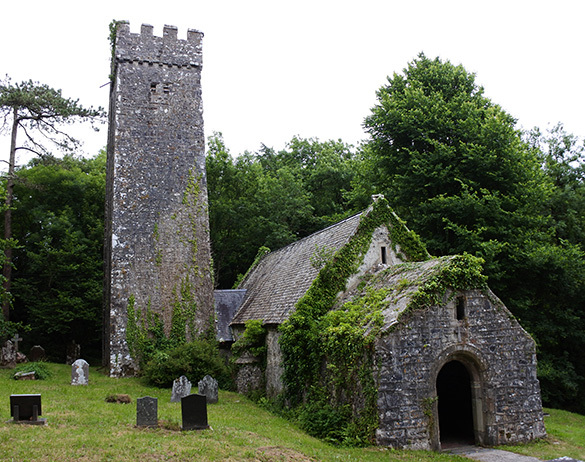 This church was built in the 12th century, likely on a site that had an earlier structure. Tim, of course, set to work identifying the building stones, using a torch and handlens. 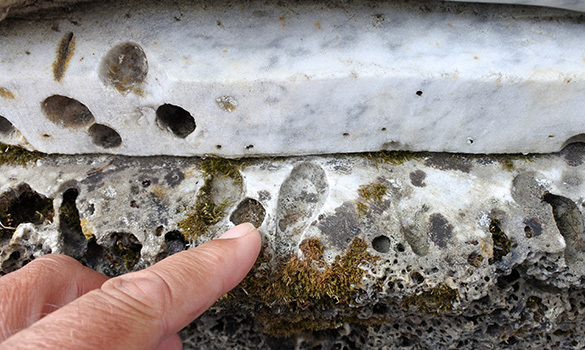 He is here examining some sort of stone basin fixed between the porch and church wall. It may have held holy water. 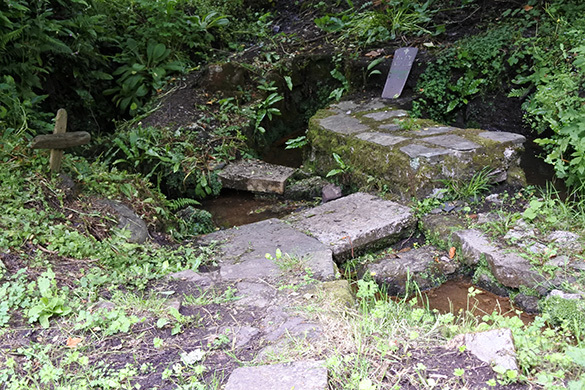 Very near the church is a set of three springs, conveniently labelled “holy wells”. 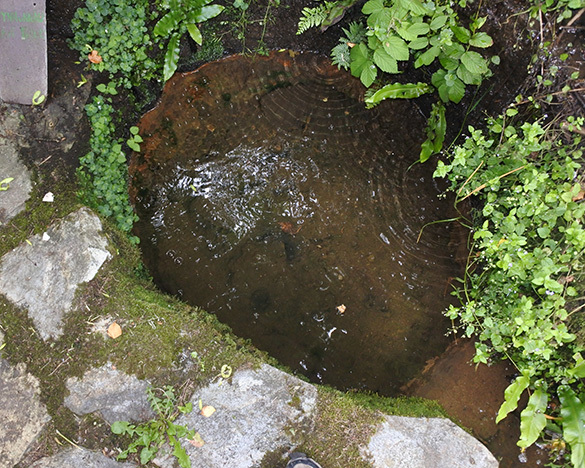 The sacred attribution to these springs goes back much earlier than the church, probably to Celtic times. The church, in fact, holds periodic Celtic Christian “services of light”, and an oak tree overhanging the springs is decorated with ribbons. Otto is the Palmer’s delightful Lhasa Apso and our companion on most of our Welsh adventures. 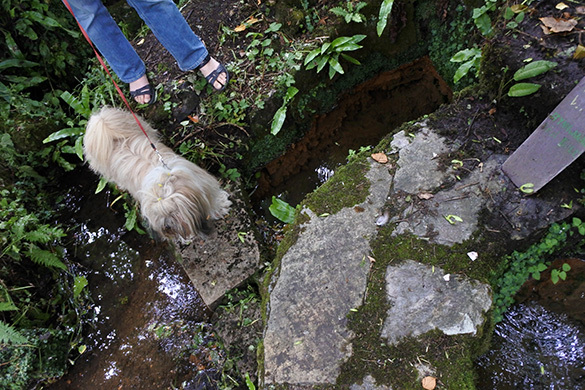 This picture was taken just before he jumped into the lower well. We can assume, then, that his eyes are now blessed. 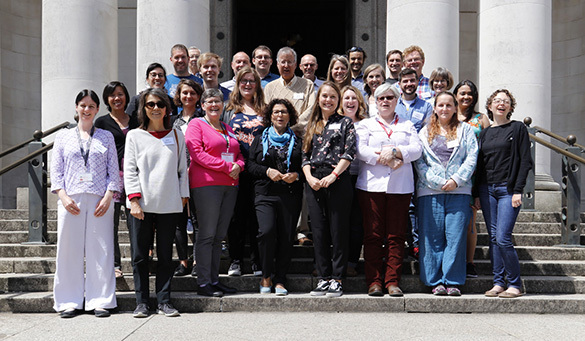 Thank you again to Tim and Caroline Palmer, and Caroline Buttler, for making my time in Wales so enriching, educational, and fun. Just let me know when you want to see the magical sites in Ohio! 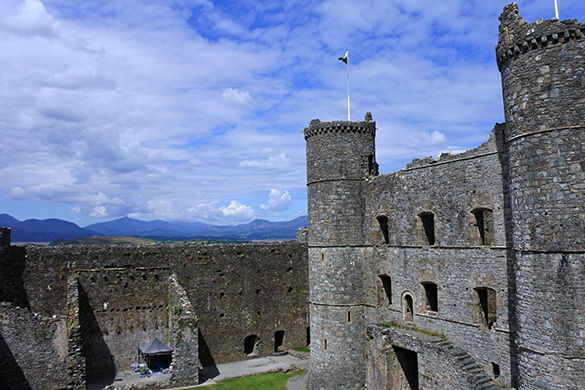 When built, Edward I made very sure Harlech Castle could be supplied by sea, so there was a water-gate on the shore. This is now the view of the ocean from the castle — it is far away, with a significant dune field along the shore. I could not find out why the shoreline retreated from the castle; it may have been a combination of sedimentation and isostatic rebound of the land in slow response to the end of glaciation. 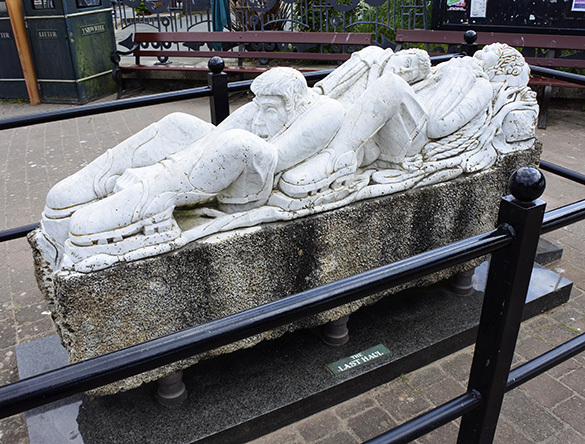 In 1709 a ship sank off the coast of Barmouth, Wales, submerging an expensive load of 43 blocks of Carrara Marble from Italy. One two-ton block was recovered after centuries on the seafloor and sculpted by an artist (Frank Cocksey) to celebrate the millennium. It is called The Last Haul, representing three generations of fishermen pulling in a net. It is beautiful carving … but you know I’m not showing it for the art. Check out the holes throughout! Our last site of the day was the Welsh town of Blaenau Ffestiniog. Slate mining made this place, starting in the middle of the 18th century. 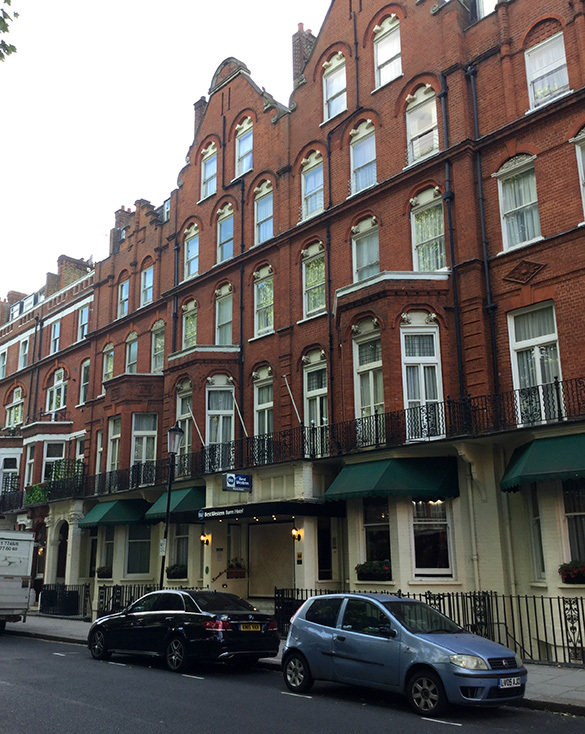 The surrounding mountains have a rich grade of Welsh slate useful for many industrial and structural applications. The town square (above) has a monument to its slate heritage. 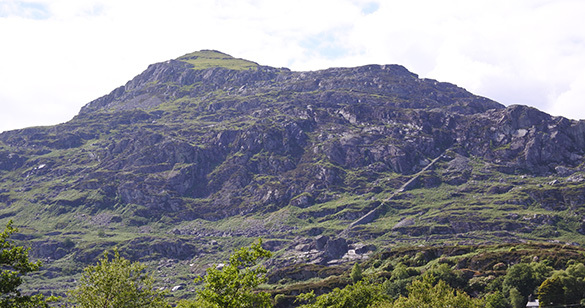 This mountain above Blaenau Ffestiniog has been heavily carved for its slate. One quarry remains operational. The Welsh slate industry declined significantly during World War I and never fully recovered. Note the massive mounds of slate debris. Slate mining produces large amounts of waste rock. 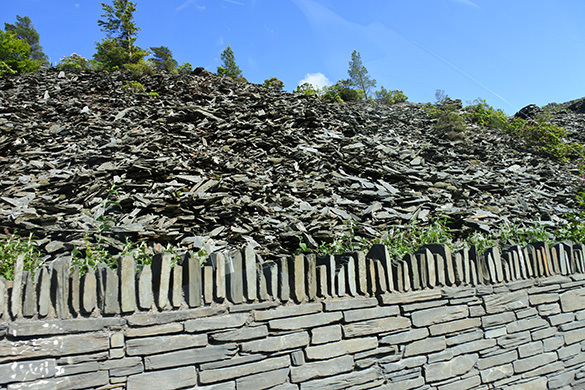 Up to 90% of the slate removed from a quarry is unusable and piled up. 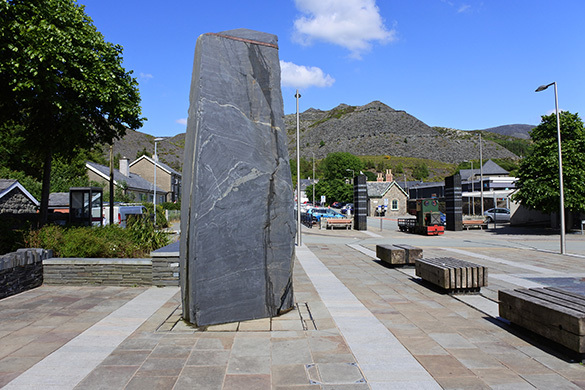 Blaenau Ffestiniog is surrounded by man-made mountains of loose slate debris. Thus ended another diverse day of Welsh experiences with Tim and Caroline Palmer. 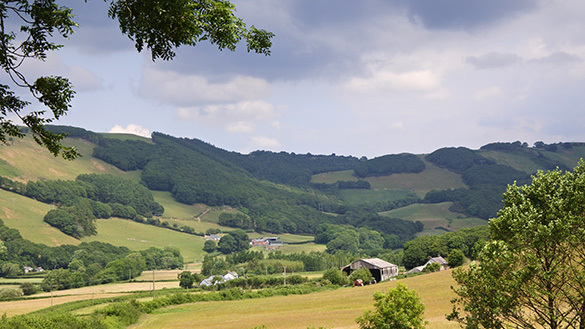 Aberystwyth, Wales — Caroline Palmer provided Tim and me a wonderful experience in a scenic Welsh valley on a perfect Welsh day. 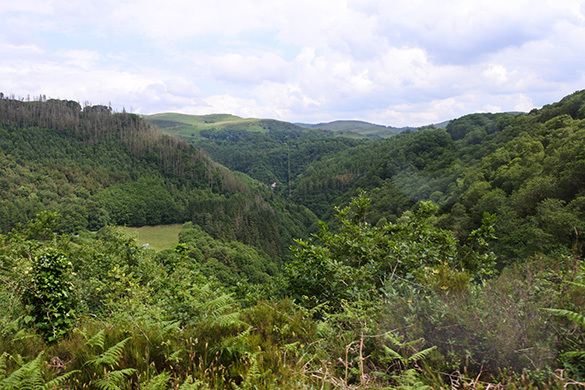 She is Trustee of the nearby Hafod Estate ( … one of the finest examples in Europe of a Picturesque landscape.”) This estate is one of the places where pine martens have been re-introduced to Wales from Scotland. In that office she received three tickets (and lunches) for us to take a ride on one of the “Great Little Trains of Wales” to a celebration of a new train carriage and a Pine Marten center. It was delightful for both the natural views and the people involved. 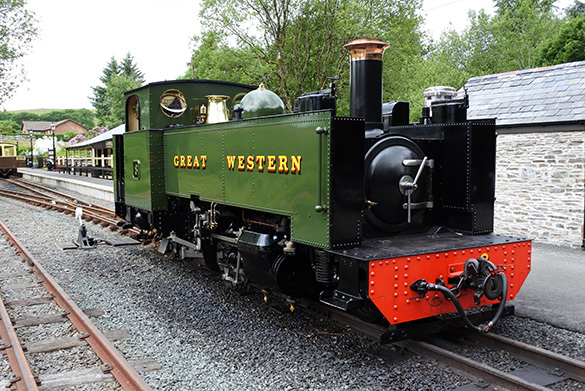 We took the Vale of Rheidol Railway with this coal-fired steam engine pulling our narrow-gauge carriages. We sat in the open car directly behind the engine, so I could watch the crew in action and feel the occasional cool droplets condensed from the steam (and a whiff or two of coal smoke). A view from the train traveling up the Vale of Rheidol. Very green and steep. This valley has numerous silver and lead mines from the early 20th century and before, leaving scattered tailings piles like this one, along with significant heavy-metals pollution in some places. 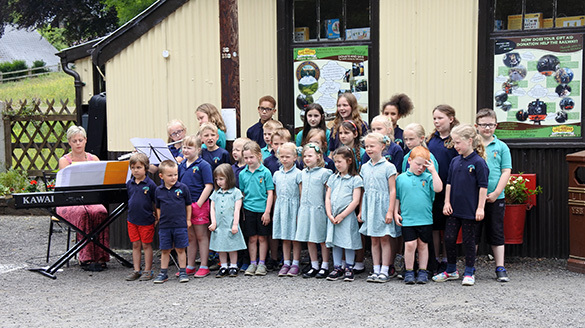 We were greeted in Devil’s Bridge by the Mynach Community School Choir singing Welsh songs. They were fun. I felt the red-headed boy’s discomfort, though! 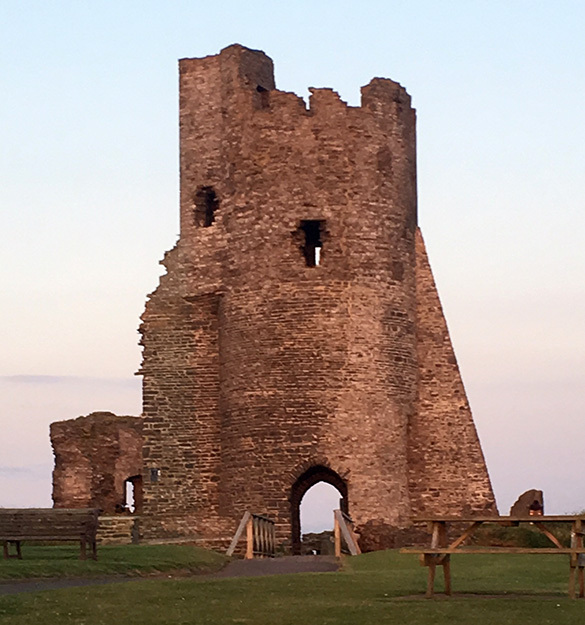 We ended the delightful day with a quick visit to the 13th century Aberystwyth Castle, a remnant of which was brilliantly lit by the setting sun. Aberystwyth, Wales — After the successful Larwood Meeting in Cardiff, I took a train to Carmarthen and met my friends Tim and Caroline Palmer for a delightful few days in Wales seeing building stones and geological sites. I’ve known Tim and Caroline since 1985, and Tim and I have published much together. Not only was I again adding to my knowledge of geology (and as always thinking of student Independent Study projects), but I was seeing old friends with whom I have much in common. Above is Laugharne Castle in the town of Laugharne of Dylan Thomas fame. The castle was originally built by the Norman lords as part of a chain of strongholds to constrain the Welsh. 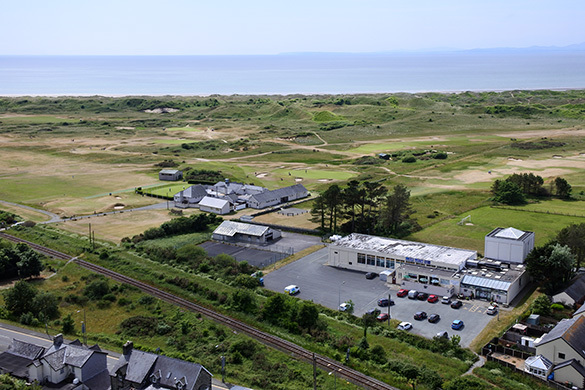 You can read about the history of the site here. The rock on which the castle was built was even more interesting, of course. 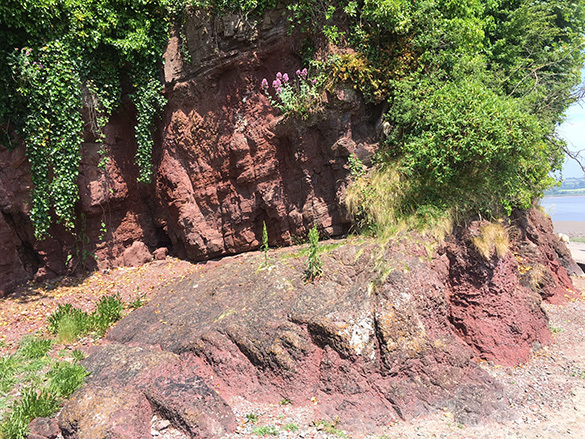 It is Old Red Sandstone (Devonian), showing a facies a bit mysterious to us. It has trace fossils (Diplocraterion? ), climbing ripples, and what may be dewatering structures. 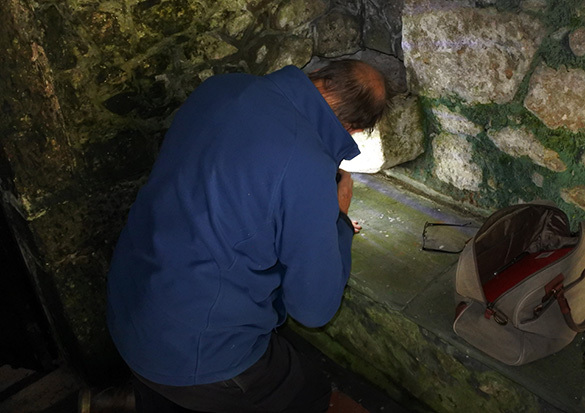 One of my favorite activities is to go into Medieval churches with Tim and study the building stones and other stonework. 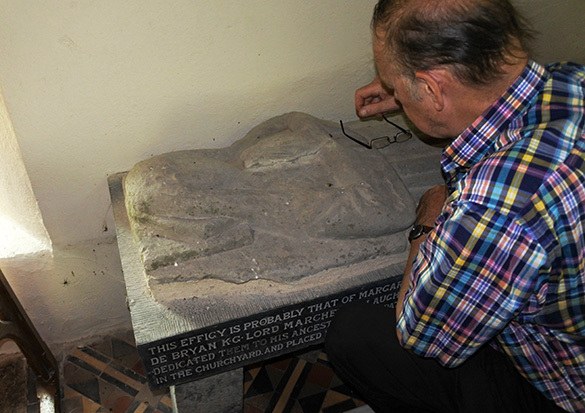 Here is Tim examining an effigy in the Llanfihangel Abercywyn church interior. Tim is an expert on building stones in Great Britain, especially the sedimentary ones used most often in Medieval and earlier structures. 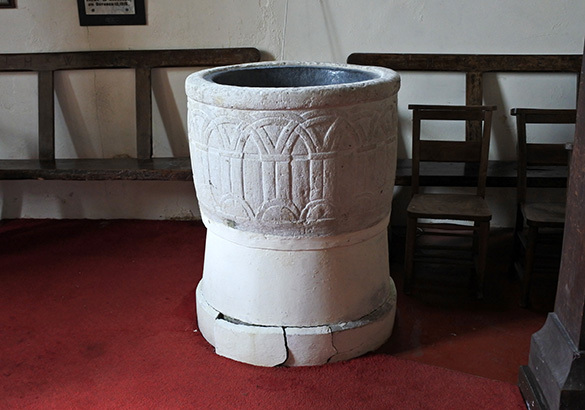 The baptismal font is usually the oldest stone object in a church because it can survive longer than larger, more complex parts. A very special treat was seeing this stone at the end of our day. 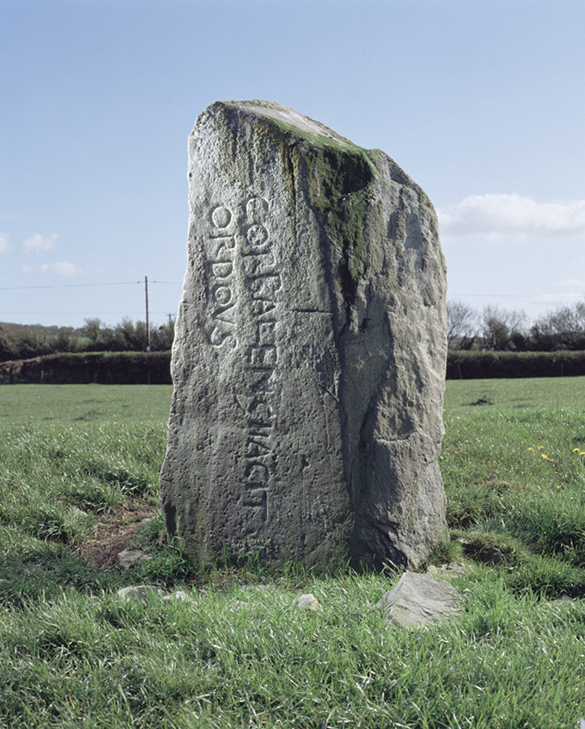 It is a monolith 1.4 meters high inscribed with “CORBALENGI IACIT ORDOVS”. This translates to: “Here lies Corbalengi the Ordovician”. 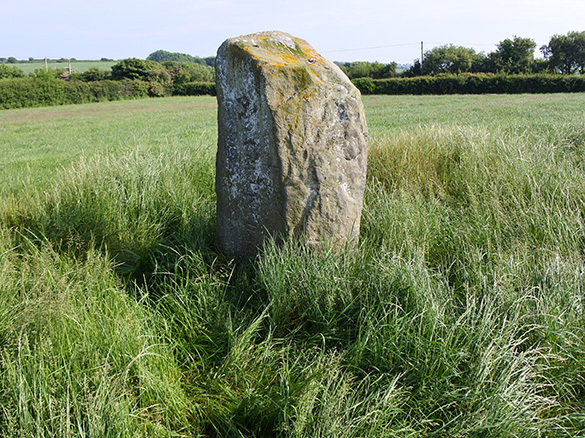 It is thus called the Corbalengi Stone. It is Celtic and probably from the sixth century. It is one of the very few inscriptions mentioning the Ordovices tribe, from whom the geological period Ordovician is named. For those of us who work in the Ordovician, this is special. We like to think of Corbalengi as the Last of the Ordovices, although there is no other evidence for this. A closer view of the Corbalengi Stone. 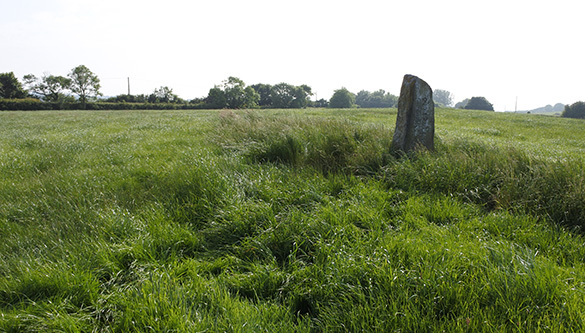 A much better image of the Corbalengi Stone, taken from this site. What a great start for the second half of my explorations of Wales. 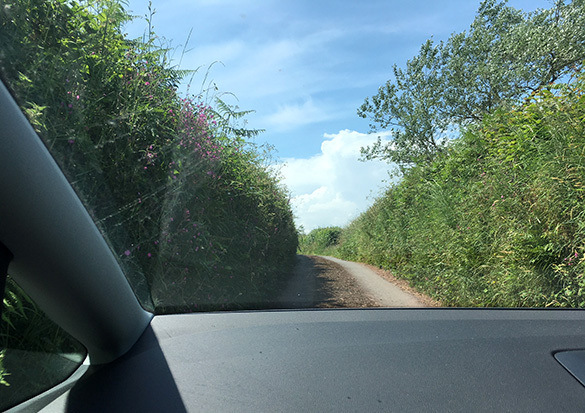 Finally, I had to add this image of driving in Wales. This is a two-way road. Tim is a superb driver, for which I’m grateful! 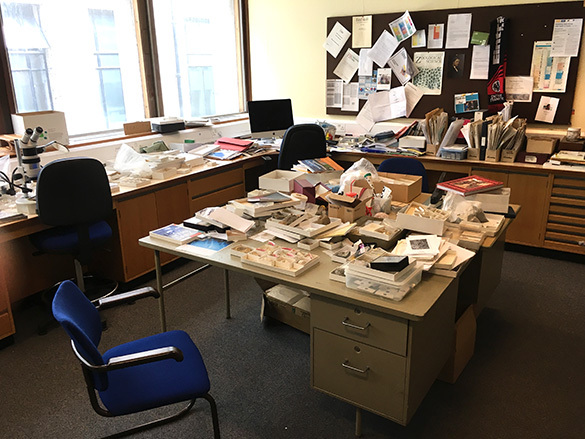 Cardiff, Wales — Today Caroline Buttler and I met in the National Museum Wales and worked on an Ordovician bryozoan project together. 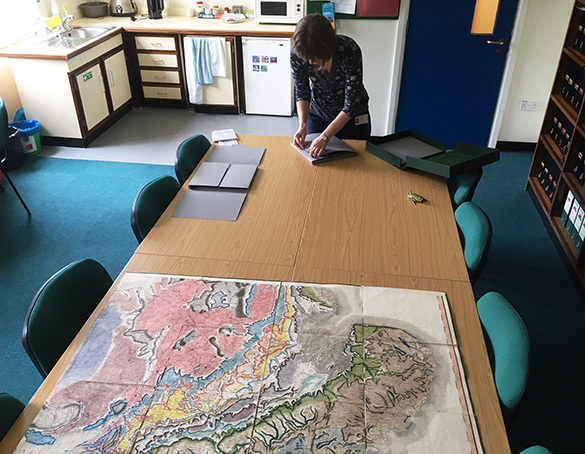 There was nothing very picturesque going on until Caroline asked if I wanted to see their original William Smith 1815 geological map of England and Wales. The map that changed the world? Of course! There is part of it carefully unfolded above. I professionally intersected with The Map on its 200th anniversary in 2015. 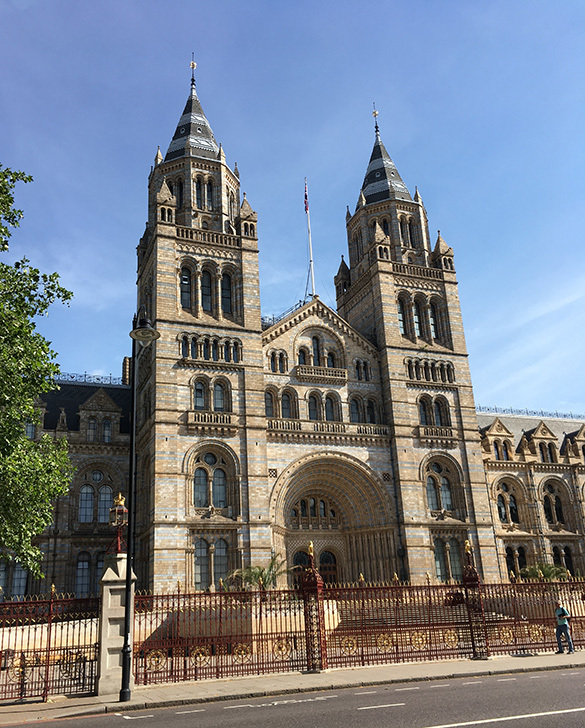 I participated in a celebratory symposium at the annual Geological Society of America meeting, giving a talk entitled: “William Smith as a paleontologist: his views on the origin of fossils, their preservation and the history of life.” (Geological Society of America Abstracts with Programs 47(7): 24.) It was fun and I’ve closely followed studies of Smith and his map since then. This was thus a treat! Thanks, Caroline. 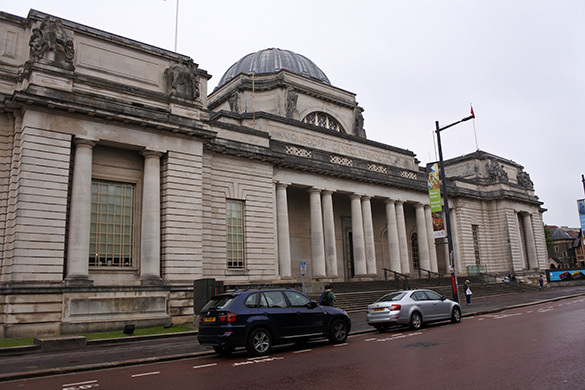 Cardiff, Wales — On our last day of the Larwood Meeting, we finished up business in the morning and then had guided tours of the marine, mollusc, and fossil collections in the National Museum Wales (above). 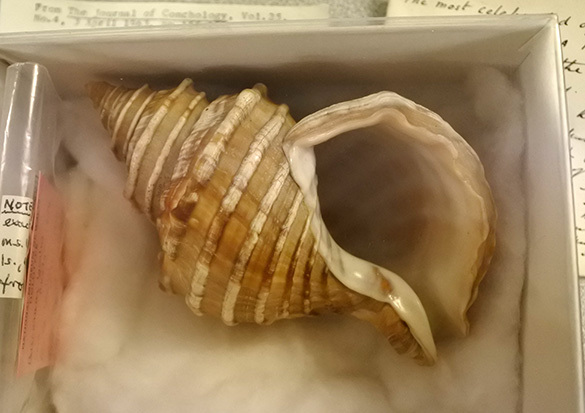 Highlights for me included this modern gastropod shell (a cold-water whelk from Alaska) collected by my hero Captain James Cook in 1778 a year before he was killed. A quote from Cook: “Ambition leads me … farther than any other man has been before me”. James Kirk of Star Trek is partly modeled after him. 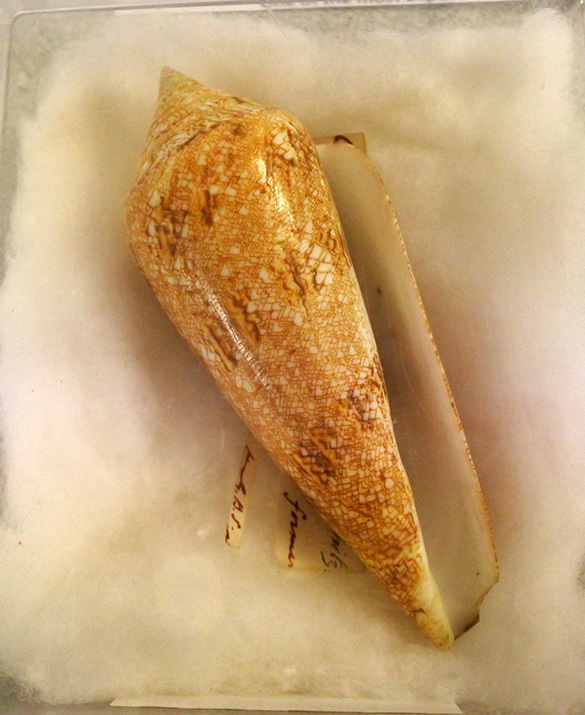 Here’s another evocative modern shell: Conus gloriamaris, once thought to be the rarest shell and thus enormously valuable. Here is the label for the specimen. 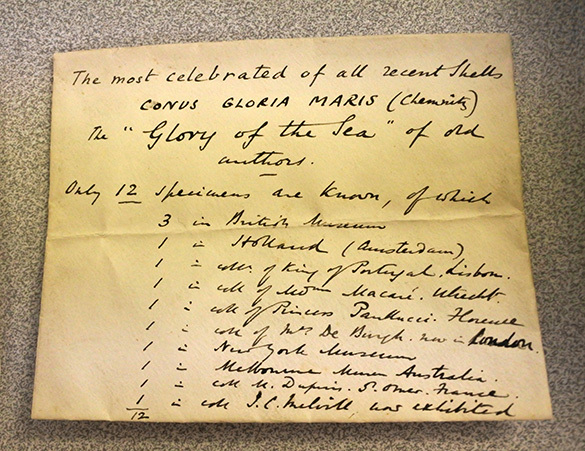 It lists the 12 known specimens at the time. It is still popular among collectors, but now much more common. 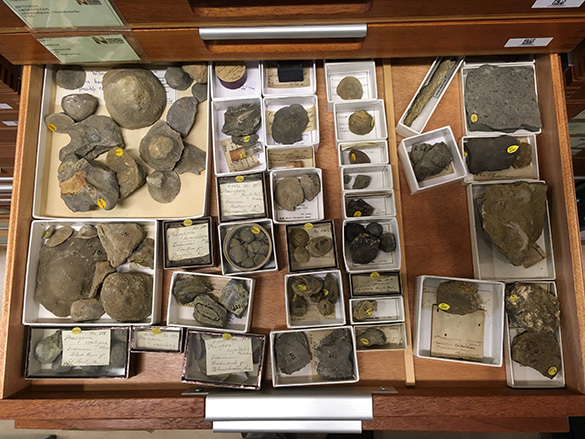 The excellent mollusc type collection of the Cardiff Museum is online. 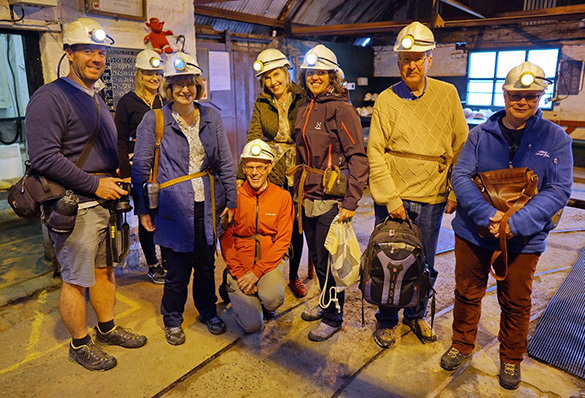 The last activity for the Larwood crew was a tour of a coal mine turned into a museum: The Big Pit. 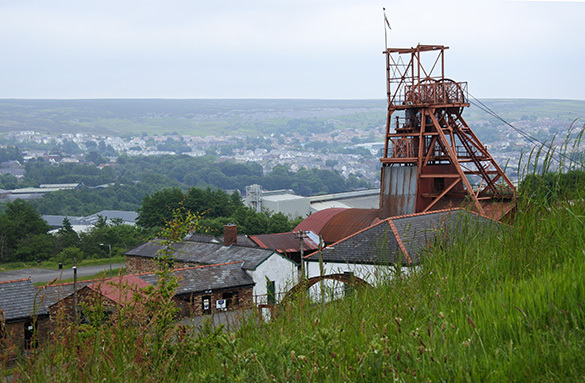 Coal in South Wales played a huge role in the Industrial Revolution, as did Welsh iron ore. 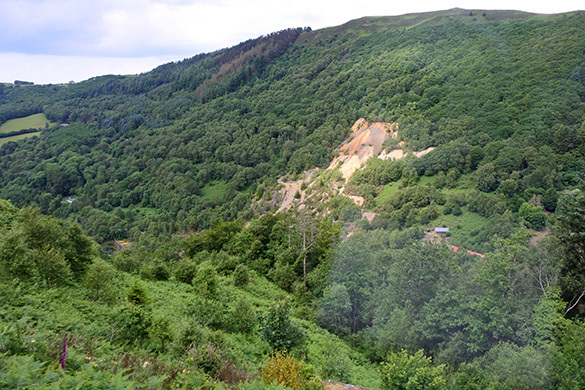 This mine tells the story of coal in Wales by taking visitors underground into the workings. And that was the end of the 15th Larwood Meeting. Thank you again to Caroline Buttler and her team for such an excellent event. We all learned more about our precious bryozoans, with the bonus of getting to explore parts of beautiful South Wales. 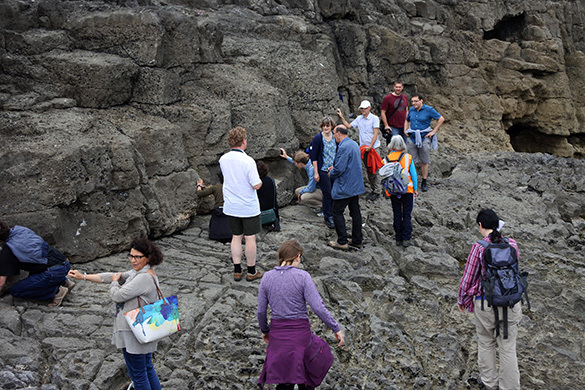 Cardiff, Wales — There is a tradition at bryozoology meetings that we get out into the field as a group. Caroline Buttler (our organizer) and Lesley Cherns (Cardiff University) took us during the afternoon to two sites. The first (shown above) is the excellent Carboniferous-Triassic-Jurassic section at Ogmore-by-Sea. Tim Palmer took me here on an epic field trip three years ago, and my blog post from then has some of the important geological details. 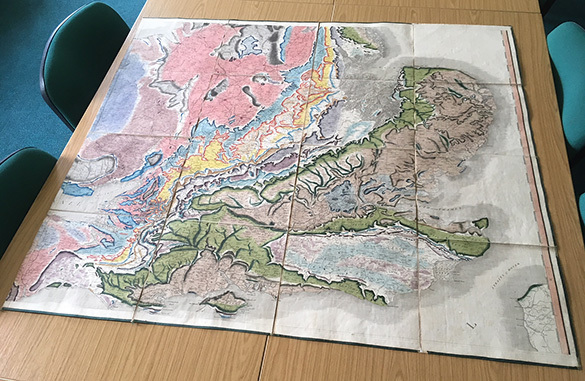 Basically, we have an extensive exposure of the Carboniferous Limestone (High Tor Limestone, Dinantian in age), topped by an unconformity with Triassic wadi deposits in some places and a Jurassic limestone (Sutton Stone, Hettangian). 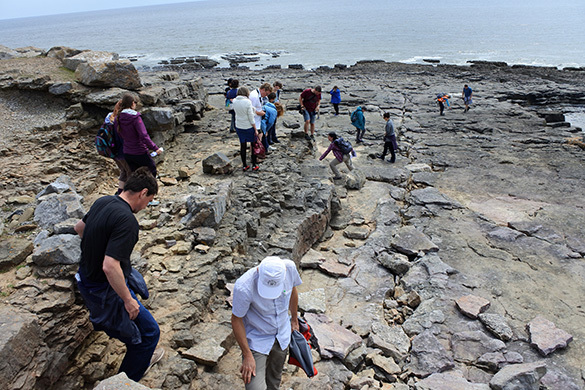 The group above is scampering about on an exposure of the Carboniferous Limestone. 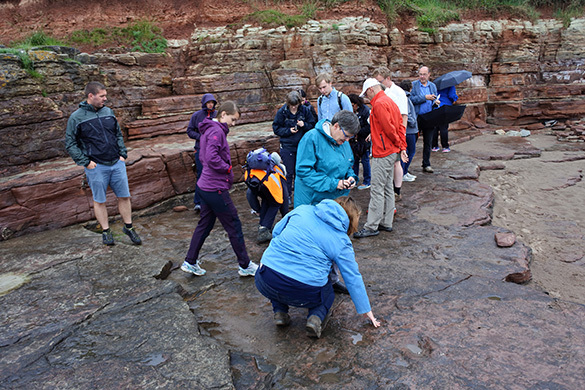 Here the bryozoologists are examining the unconformity between the Carboniferous Limestone (which they’re standing on) and the Jurassic Sutton Stone above. 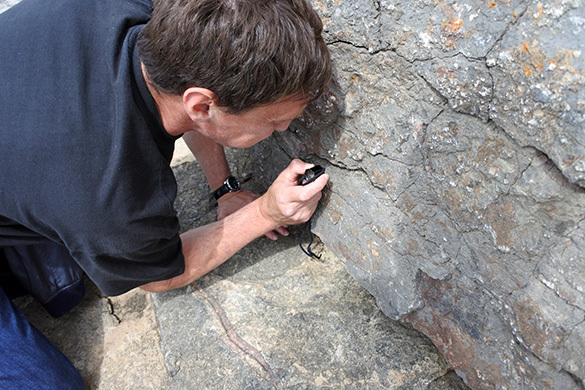 Andrej Ernst (University of Hamburg) managed to find tiny bryozoans in the Carboniferous Limestone. 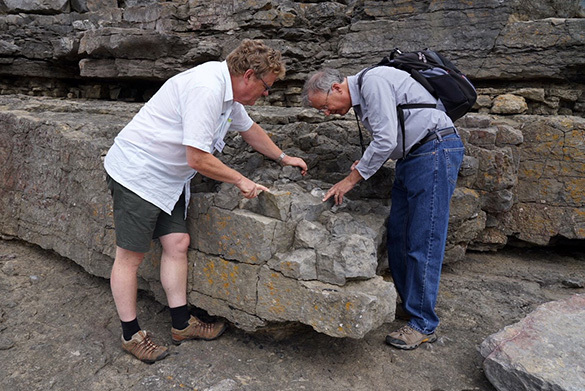 Hans Arne Nakrem (University of Oslo; Natural History Museum) and me looking studious with the Carboniferous Limestone. The Carboniferous Limestone has fantastic sections through large rugose corals. 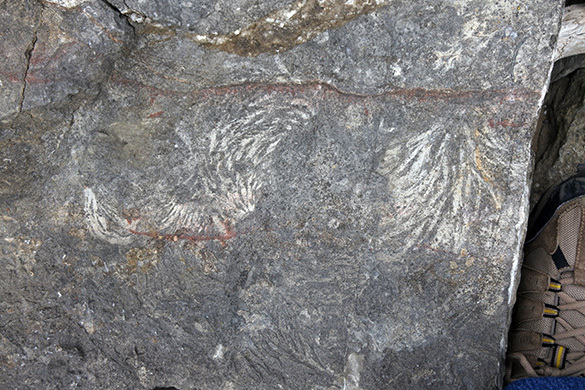 The trace fossil Zoophycos (“rooster tails”) is also common in the Carboniferous Limestone. … dinosaur footprints! 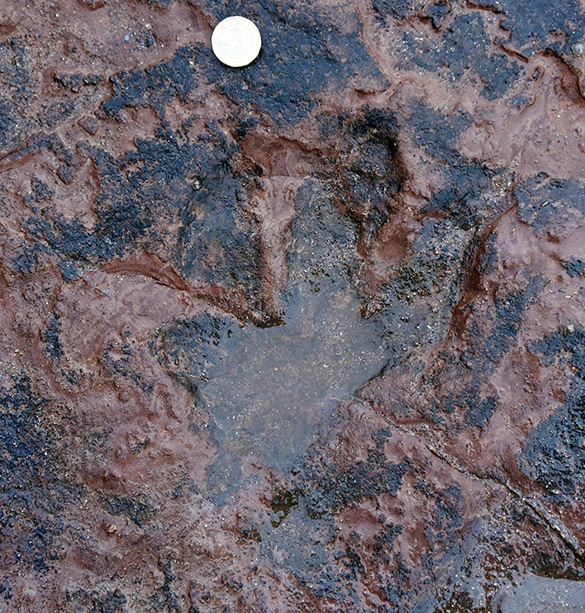 One rather battered example of a print from a three-toed theropod dinosaur is shown above. (Grallator is the ichnogenus.) 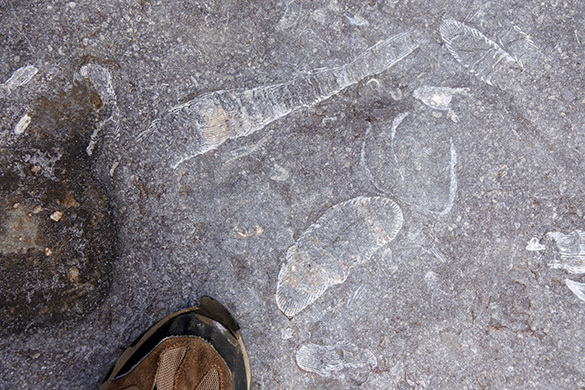 These were among the earliest dinosaurs, so seeing such a trackway is very cool. You can read here a detailed assessment of the tracks. Thank you again to Caroline Buttler and Lesley Cherns for arranging this fun trip.